It’s not every day the CEO of a company asks its users for what they want. Here’s your chance to change Twitter. It’s received more than 350 replies in less than 20 minutes, with the most popular request being the ability to edit your tweets. Be warned: if you make a suggestion, be prepared to explain how it would work. This isn’t one of those drop-off suggestion boxes. 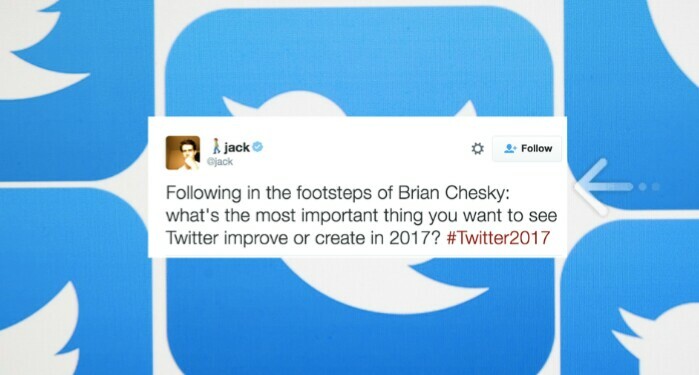 Dorsey is responding to the requests, and telling people what Twitter has been doing to accomplish those needs. With editing tweets, he noted it was a bit tricky. Between editing mistakes like typos immediately after sending and adjusting tweets at any moment, Dorsey noted there was a big difference in rolling out the feature. He’s also asking people who reply to be more specific about a potential editing feature. Other people demanded better abuse protection, after Twitter reached its boiling point with trolls in 2016. Dorsey replied to one request and said Twitter has been working on its policies and controls, but also asked another user for more specific protections. After someone recommended adding more features to Twitter lists, Dorsey admitted that the company “dropped the ball” on them, and thanked @zeynep for her suggestion. It’s been a troublesome year for Twitter, as the social network failed to attract any buyers while facing financial troubles and killed off Vine. Unable to keep up with its massive competitors on Facebook and Snapchat, Twitter has started embracing its role as a media company, pushing for more live streams and news alerts. Dorsey is taking the same approach for Square, his mobile payment company. It’s gotten less than 100 replies in 40 minutes, compared to the blast of suggestions for Twitter.